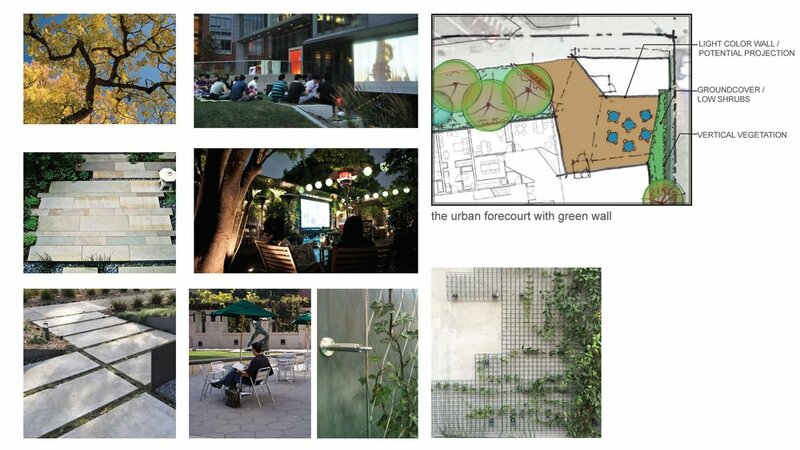 A covered outdoor space for dining, movie night, and vertical green features complements the retail near the entrance. Along SE Pioneer Way, a dense and wide planting strip screens the traffic noise and provide urban-natural background for residents. Through the forecourt, the social play area extends into Hal Ramaley Memorial park, providing more active space for residents. Proposed gardening space provides more options and contributes to existing neighborhood gardens at the south of the project. Multi-purpose parking with all pervious pavement allows stormwater to percolate, and also provides a get-together space for community events.